Precious metals are the standard catalyst material used for extracting hydrogen from water. The problem is these materials - such as platinum, ruthenium and iridium - are too costly. A team from KTH Royal Institute of Technology recently announced a breakthrough that could change the economics of a hydrogen economy. "The new alloy can be used to split water into hydrogen," says researcher Peili Zhang. 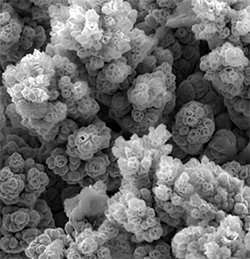 "This catalyst becomes more efficient than the technologies available today, and significantly cheaper. "This technology could enable a large-scale hydrogen production economy," he says. Hydrogen can be used for example to reduce carbon dioxide from steel production or to produce diesel and aircraft fuel. It's not the first time a cheaper material has been proposed for water splitting, but the researchers argue that their solution is more effective than others. They published their results recently in the scientific journal Nature Communications. "The high catalytic performance of core-shell NiFeCu for water oxidation is attributed to the synergistic effect of Ni, Fe and Cu," Zhang says. Zhang says that copper plays an interesting role in the preparation of the electrode. In an aqueous solution, surface copper dissolves and leave a very porous structure to enhance the electrochemically active surface area. "The porous oxide shell with its high electrochemically active surface area is responsible for the catalytic activity, while the metallic cores work as facile electron transport highways," Zhang says. I respect what these researchers are trying to do and why, but it feels like I have read 10,000 titles like this and none of them have turned out to be real game-changers. I agree, but we are a persistent species and the prize is great.